The Liberty-Perry Wellness Council would like to announce their 4th Annual Health Fair and Blood Drive. 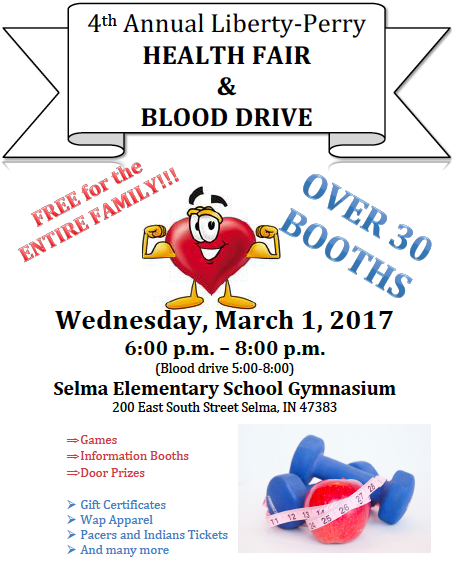 The event will happen Wednesday, March 1st from 6-8 at the Selma Elementary Gymnasium. The Blood Drive will start a little earlier at 5:00 in the gym. The event is free for the entire family. The Health Fair will offer over 30 booths from area services and businesses. While going through the booths, there will be many activities, great information, and games for the entire family. With over 30 door prizes, drawings will be held every 30 minutes. The door prizes consist of Indiana Pacers and Indianapolis Indians tickets, gift certificates from area merchants, Wapahani apparel, and many more! And, don’t forget the BLOOD DRIVE! This is an exciting event that we are pleased and proud to offer the community. Come out and see for yourself! !